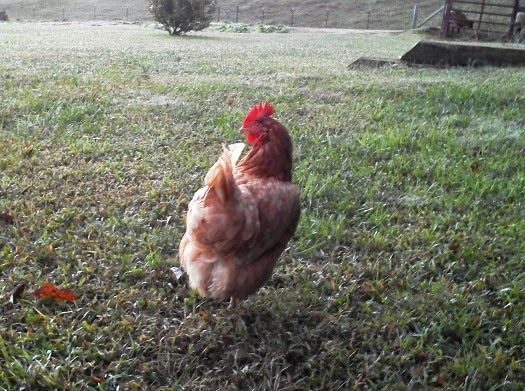 It was getting dark and someone was missing; one large red hen with a pair of big yellow feet and an attitude to match. I looked up and down and in every nook and cranny with my flashlight there was no sign of her. The only clue was a red tail feather I found in the grass near the barn, and that is never a good sign. Most of the time if there has been a predator attack there is more than one feather on the ground, so that made me think she could still be out there somewhere, but as darkness fell and my batteries started getting weak, hope of finding her alive faded with my flashlight. Meandering across the back yard, looking over her shoulder as if she was hoping nobody would see her sneaking back to the chicken coop before dawn. My heart was happy! Enjoy your weekend, give Miss Lily a hug for me. You have a way with the word or turn of a phrase. You had my attention. I thought maybe she was out in the hay loft sitting on a nest full of eggs! I love the cute way you shared this story. Wishing you guys a good weekend. Too cute!! A night on the town!! Beautiful sky in the first photo. WHEW!! finally I could breath and my hear twas happy she was okay. HEY, dont you have a dog... Miss Lily is her name......cant she use that nose of hers and go sniff her out??? hum???? HOPE all will be calm on the farm for a bit so you can relax and enjoy this cooler weather sitting on the back porch sipping and rocking. You certainly know how to tell a great story! Thanks for the chuckle! Glad she's home safe but now she's a loosey-goosey. Haha...that is funny and I love how she is looking over her shoulder. LOL! You are so funny. So is that hen! Hahahaaa....slipping in at all hours of day and night! TuskTusk!! Oh Paula-you made me smile today! That was so sweet! I am glad she is well. LOL! LOL. good one Paula. She'd been hanging with the dry cattle as my mama use to say..lol. What a floozy... out all night. LOL That's one wild chick you have there. I love happy ends! Thank You! Once the fox family have party with my hens. I didn't feel so nice after that. But I believed that some fox didn't have a empty stomach. Oh, I'm so glad the chicken was safe. She's such a lovely bird. Thanks God! She was safe. She is soooo pretty!